A Harvard professor with a long acquaintance with Singapore reflects on its socialist roots and says it should continue to show the world a middle way. In 1971, one year out of Harvard University, I spent two weeks in Singapore as part of my first trip to Asia. I had been lucky to win one of two "travelling fellowships" Harvard awarded to graduating seniors - allowing travel wherever one wanted, with the only requirement being to write a report when done. Almost every winner used the fellowship to travel to Asia, because even then it was common for young Americans to travel to Europe, but much more so to Asia. In Asia, Singapore was one of my longer stops along a route also taking me to Japan and India (one month each), Hong Kong (two weeks), Korea, Thailand, and Indonesia (one week each), and Nepal (three days). The most interesting thing about my decision to visit Singapore at all, and to stay a full two weeks, was that it came about because of my admiration for the People's Action Party (PAP) government, which mixed strong opposition to communism with commitment to socialism. Since junior high school, I had been very interested in politics. I had always been on the left, but at age 16, my path diverged from other political students in my high school because of disillusionment with Cuban leader Fidel Castro's embrace of dictatorship. I rejected the brutality and inhumanity of communism. Instead, staying on the left, I became a convinced social democrat, in the tradition of the German Social Democrats, British Labour, and especially the Swedish Social Democrats. Sweden was my first love then. An American writer in the 1930s had dubbed Sweden a "middle way" between communism and fascism. They had chosen a welfare state to promote equality and social justice while gaining the productivity and innovation benefits of keeping industry in private hands. I actually started studying Swedish in my junior year and had spent time there on a scholarship after graduating. What brought me to this tiny speck of land 15,000km from America in 1971 was that Singapore became my second love. This was a time when, in the context of opposition to the Vietnam War, Asian communism was on the ascendance. Many Western young people admired revolutionary leaders such as Vietnam's Ho Chi Minh and China's Mao Zedong. I learnt that Mr Lee Kuan Yew in Singapore had beaten back the communists, but remained an advocate of socialism. In 1968, the first time I went to Sweden, Mr Lee spoke at the congress of the Socialist International, the organisation of social democratic parties. In 1970, the PAP re-affirmed its commitment to socialism, stating Singapore had made significant strides towards achievement of "our socialist goals, a more just and equal society". The PAP's frugal style and hatred of corruption, symbolised by the white garments activists wore, also appealed to me. Stopping communism, promoting social justice, and being honest were noble causes for which the PAP was struggling. To me, Singapore was an Asian middle way, offering the world a path between communism and unfettered capitalism. I wanted to visit to learn more. 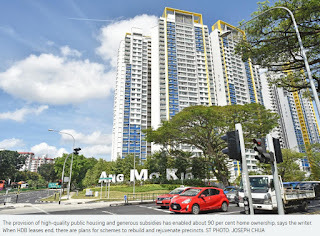 I had read about two social achievements, government-subsidised housing and its role in encouraging industrial development at Jurong. While there, I gave myself a young social democrat's tour of Singapore. I took buses to visit a Housing Board estate and journeyed to the Jurong Industrial Estate. It turned out that the Swedish machinery company ASEA (now ABB) had a small facility there, which I came across during my visit. To reflect my passions for Sweden and Singapore, I snapped a picture. I also took pictures of People's Park, which had then opened only a year earlier - my social democratic soul relished the moniker. And, to add to my knowledge, I bought a book on Mr Lee by Alex Josey, a Briton who worked on psychological warfare against Malayan insurgents and later became Mr Lee's press secretary for a decade, that gave me details on his fight against communists. I also bought a book, complete with colour photos, on the HDB. I actually, presumptuously, requested an interview with Mr Lee himself. I had written a book critical of US student radicals that was published in my senior year at Harvard and syndicated in The Chicago Tribune. The Tribune had accepted my idea of writing occasional columns they would syndicate while I was travelling. Officials got back to me to say the Prime Minister was not available, but that I could interview the Finance Minister, Dr Goh Keng Swee. The only thing I remember from the interview is that he discussed Singapore's eagerness to attract foreign investment to help growth, and thus to pave the way for later development of more generous welfare policies. Seeking foreign investment was then quite controversial among many developing-country governments, on the grounds that this would promote dependence in newly freed nations. Dr Goh's approach of promoting growth as a first stage towards redistribution appealed to me as a middle way between giving no role to private business and letting companies run roughshod. My stay of course was not just politics. For most of my trip, I stayed at youth hostels but in Singapore, I decided to treat myself and, using royalties from writing, stayed at the Raffles Hotel. One of my most vivid memories was Queen Elizabeth Walk, just across from the Raffles and fronting parallel to the sea, before the land reclamation of later decades. It was a fairly quiet green oasis filled with strollers. There I tasted satay for the first time, bought from one of the many hawkers (I didn't know that word then). It was love at first bite, and I ended up eating half my dinners there - usually chicken, with lots of peanut sauce. Sometimes it was noodles with vegetables, whose somewhat smoky, pungent smell I still remember, and occasionally nasi goreng. The Padang was near the Raffles, and I went by pretty often; in those days, the Padang was much more important in the city than now. I frequently saw people playing informal ball games. I have been visiting Singapore on and off since then, for a total of more than five visits. In 2012, I was in Singapore for six weeks to serve as the Li Ka Shing Visiting Professor at the Lee Kuan Yew School of Public Policy (LKYSPP), and have periodically delivered individual lectures there. During my most recent trip last November, I spent almost a week in Singapore and met academic friends such as LKYSPP dean Danny Quah, and the legendary Tommy Koh, former Singapore ambassador to the US. My impressions of Singapore 50 years on? Clearly, there's a lot to like about what the PAP has done during these decades, transforming Singapore from the Third World to First - though I think calling Singapore in the 1960s "Third World" is a somewhat poetic exaggeration. Of the countries I visited in 1971, most - South Korea, Indonesia, Thailand, India, Nepal - were poorer than Singapore. Singapore's growth and the alleviation of poverty have been outstanding. Singapore student test scores are world-leading, leaving the US in the dust. Singapore to me physically is not only a vibrant but often also a beautiful city. However, the social democrat in me was taken aback to read in Mr Lee's memoirs that he and his government had long decided that socialism did not work: "Watching the ever-increasing costs of the welfare state in Britain and Sweden, we decided to avoid this debilitating system. We noted by the 1970s that when governments undertook primary responsibility for the basic duties of the head of a family, the drive in people weakened. "Welfare undermined self-reliance. People did not have to work for their families' well-being. The handout became a way of life. The downward spiral was relentless as motivation and productivity went down. People lost the desire to achieve because they paid too much in taxes. They became dependent on the state for their basic needs ." I had always associated Singapore with the protections and redistribution of a welfare state, and the explanation I had heard back in the early 1970s for the lack of government-provided social security had been that Singapore hadn't introduced these "yet" because the country was still too poor. I hadn't known that there had been some statements in a similar vein that Mr Lee had made as early as the beginning of the 1970s. As a party, the PAP has clearly undergone a shift in ideology from being socialist democrat. I consider myself an admirer of Singapore - feeling a sense of kinship with its socialist democrat roots - who remains a fan enamoured of the modern city-state it has become. One thing though that worries me about today's Singapore is that the nation appears to have moved from being a cause to being more of a corporation. The ideals the PAP fought for in the 1950s and 1960s, I am not ashamed to state - despite the local encomiums to pragmatism - were noble ones. Singapore helped turn communism back in Asia, in a very tough battle. Along the way, it has helped build a nation and delivered a good standard of living to two, three generations of Singaporeans. I hear from Singaporean friends that the recent few years have seen a resurgence of concern about redistribution and that PAP leaders have spoken openly about shifting "left" closer to its social democrat roots. There has been a fair amount of commentary and debate about the future of Singapore's economic and political system, including in The Straits Times. The social democrat in me fears that a low tax regime, particularly on capital, may have become orthodoxy for its own sake rather than an unfortunate adaptation to a perceived harsh reality. If it is viewed more as the latter, there would be more serious discussion about raising taxes at the top end to fund a more generous redistribution system that can reduce inequality. If Singapore were to revisit its socialist roots, it would have to face the fact that taxes have become lower and less egalitarian. The top tax rate on individual income was 55 per cent in 1980, but starting in 1982 it was successively lowered eventually to reach 20 per cent in the early 2000s. The corporate tax rate was 40 per cent until 1987, when it was lowered to 33 per cent, then in 2000 to 26 per cent and 17 per cent in 2010. (In the United States, after a massive corporate tax rate cut of over 50 per cent under President Donald Trump, our corporate tax rate is 21 per cent, and many US states also tax corporate profits separately.) The estate tax on wealth was abolished in 2008. Singapore, unlike the US, has never had a tax on capital gains (such as capital gains on property or stock profits). In 1994, a goods and services tax was introduced, a consumption levy taking more of a bite from low-than high-earners. If one's goal is to have lower taxes than other countries, this is good policy. But the earlier PAP would have explicitly included redistributive goals that seem now subordinate. I see recent debates on inequality as part of an effort to return the PAP to the social justice side of its roots. In the 2015 Budget, the top personal income tax rate was raised from 20 per cent to 22 per cent; when announced, The Straits Times reported that the "Government announced a move to tax the rich more". The Government's role in healthcare provision is also expanding. Call me nostalgic, but I'd like to add myself to those who would like some rebalancing of Singapore social and economic policies, and a renewed attention to the dual nature of the PAP's original message, to the idea of Singapore as an Asian middle way. Singapore's middle way helped show the world an alternative to communism and fascism in past decades. In the current global debate on the balance between workers and the elite, and on the ills of populism, Singapore can continue to show the world a middle way between the excesses of capitalism and unsustainable unfettered welfare. Steve Kelman is Weatherhead Professor of Public Management at Harvard University's John F. Kennedy School of Government. During 2012, he was Li Ka Shing Visiting Professor at the Lee Kuan Yew School of Public Policy. Despite its generally low taxes, Singapore is still able to achieve social outcomes - in education, healthcare, and home ownership - beyond that of other countries. This is the result of "a carefully calibrated combination of maintaining a broad tax base, diverse sources of revenue, viable economic strategies, sound governance, and fiscal prudence", said Minister in the Prime Minister's Office (PMO), Ms Indranee Rajah, in a commentary in today's The Sunday Times. And while the economy is based on free-market principles, the fruits are harnessed to build a fair and inclusive society, she added. 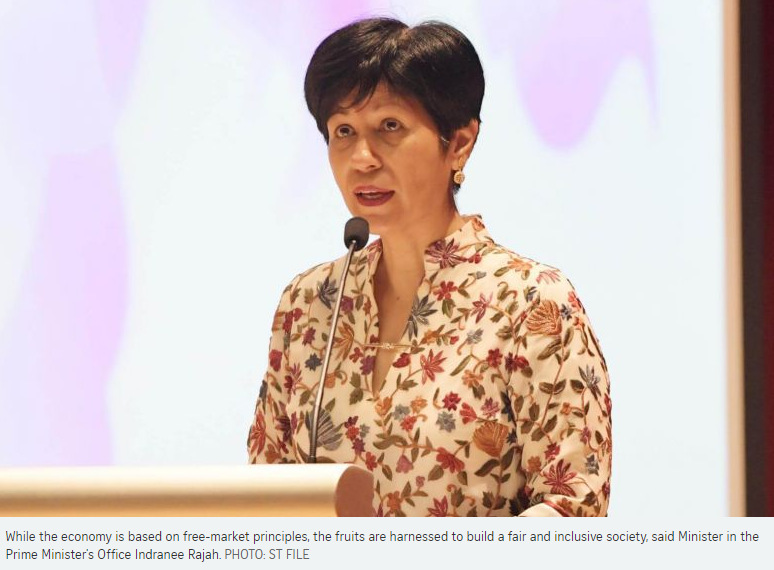 Ms Indranee, who is also Second Minister for Finance and Education, was responding to a commentary on Singapore's socialist roots by Harvard professor Steven Kelman, published in last Sunday's papers. While he praised Singapore's growth and alleviation of poverty, Prof Kelman said he was worried that today's Singapore has "moved from being a cause to being more of a corporation", and noted how the People's Action Party (PAP) had undergone a shift in ideology from being socialist democrat. In response, Ms Indranee said that the PAP government "remains true to its mission of a fair and just society, by creating opportunities for all, redistributing wealth according to need, and effective social spending". She added that despite Singapore's generally low tax rates, expenditure by social ministries has doubled between Financial Year (FY) 2009 and FY2018. This is achieved in three ways: First, supplementing the revenue by the Net Investment Returns Contribution (NIRC) - the income on the reserves. The NIRC has more than doubled from $7 billion in FY2009 to $16 billion in FY2018, Ms Indranee said. Second, Singapore maintains fiscal prudence and avoids high debt, and, third, taxes are collected and used effectively, she noted. While Prof Kelman noted how Singapore's corporate tax rate was 40 per cent until 1987, and progressively lowered, Ms Indranee pointed out that reinstating this would be a "crushing burden on our companies and render us uncompetitive, resulting in loss of investments, jobs and revenues". She added: "We are not preoccupied with growth for growth's sake, but because growth creates jobs and gives our people good incomes while generating the tax revenues necessary to help our elderly, vulnerable and disadvantaged and meet other vital public needs like defence and infrastructure." A fair and progressive system is maintained and half of Singapore's working population does not have to pay taxes, she noted. "Of those who do, the ones who earn more, pay more. On redistribution, we ensure that those who need more, get more," she said. "If we were truly an unbridled corporation, we would not put back revenue from land sales into past reserves, or refrain from using up all the income from our reserves. But we do, because we believe that we must keep something for our children and grandchildren. "For the PAP government, Singaporeans and Singapore remain very much our cause. Our means may be capitalist but our objectives and goals are caring and compassionate... Ours is a middle way uniquely our own," she concluded. In his piece, "Singapore 50 years ago and now: An Asian middle way?" in last week's Insight, Professor Steve Kelman applauded Singapore's growth and alleviation of poverty but wondered if we had become "more corporation than cause". He hoped Singapore could continue to show the world a middle way between the excesses of capitalism and an unsustainable welfare state. It is heartening that we have international friends who have followed our progress through the years, and who wish us well. For that reason, I felt that I should assure Prof Kelman and other friends that the People's Action Party (PAP) Government remains true to its mission of a fair and just society, by creating opportunities for all, redistributing wealth according to need, and effective social spending. We are doing this in a way unique to Singapore, through innovative policies evolved over the years. We have avoided ideological straitjackets, focusing instead on what really works, as encapsulated in the PAP founding leaders' 1970s essay collection titled: Socialism That Works... The Singapore Way. Conventional Western orthodoxy is that social justice must necessarily be achieved through higher taxes. By that measure, the higher the tax rates, the more just and fair a society ought to be. Yet Singapore bucks this - topping as it does global indices for key social outcomes such as education, healthcare and home ownership, ahead of countries with significantly higher tax rates than ours, as shown by the recent World Bank Human Capital Index. And despite our generally low tax rates, our social ministries' expenditure has doubled between FY2009 and FY2018. How have we been able to manage this? First, we do not solely rely on taxes. Our revenue is supplemented by the net investment returns contributions (NIRC), that is, income on our reserves, a feature unique to Singapore. The NIRC has more than doubled from $7 billion in FY2009 to $16 billion in FY2018. Without this annual injection, we would have had to double our personal income tax or goods and services tax (GST) collection to raise the same amount of revenue. Second, we maintain fiscal prudence and avoid high debt. Many governments in countries with tax rates higher than ours have to use part of those revenues to service debts they or predecessor governments have accumulated; it does not all go to public spending. Third, it is not just how much you tax, but also how effectively you collect and use that tax. We have a robust tax collection system to prevent leakage. We insist on good governance to avoid wastage. We crack down on corruption to prevent rot. We push for efficiency, productivity, and value for money so that the public gets maximum return on its tax dollars. All this is driven by our unwavering and unyielding determination to secure good outcomes for our people out of limited resources. We are firmly committed to the redistribution of wealth. But we are acutely conscious that in order to redistribute wealth, you must first have wealth to redistribute. Hence, our strong focus on growing the economy and making Singapore an attractive destination for companies and businesses. We are not preoccupied with growth for growth's sake, but because growth creates jobs and gives our people good incomes while generating the tax revenues necessary to help our elderly, the vulnerable and disadvantaged, and meet other vital public needs like defence and infrastructure. We are a small country. We have to compete with countries far bigger and with greater resources. The stark reality is that if tax rates are pushed too high, it will also push people and businesses that can generate wealth not to stay here, with knock-on adverse consequences. Reinstating our 1987 corporate tax rates of 40 per cent would be a crushing burden on our companies and render us uncompetitive, resulting in loss of investments, jobs and revenues. Our ability to achieve social outcomes beyond that of other countries, despite generally low tax rates, is the result of a carefully calibrated combination of maintaining a broad tax base, diverse sources of revenue, viable economic strategies, sound governance, and fiscal prudence. If our needs go up, and we have no choice but to raise taxes (such as GST), we will do so, but will keep it within a sustainable range - allowing us to meet needs, stay competitive, but not imposing an intolerable burden and cushioning the impact on those who feel it most. We maintain a system that is fair and progressive. Half of our working population does not have to pay tax. Of those who do, the ones who earn more, pay more. On redistribution, we ensure that those who need more, get more. 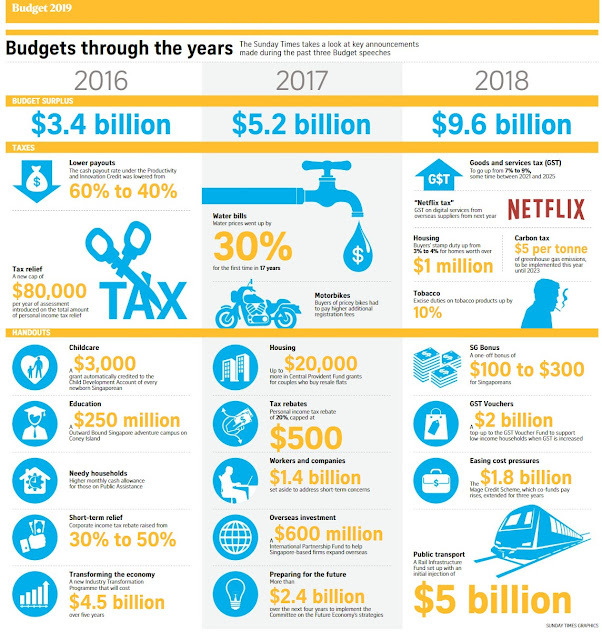 • The lower-income get close to $4 in government benefits for every dollar paid in taxes, through social transfers such as GST Vouchers, Workfare, Silver Support, and high healthcare, housing and childcare subsidies. They do not incur personal income tax. They incur GST, but that is offset by vouchers, and so effectively, the impact of GST is reduced. • The middle-income group receives more than $2 in government benefits for every dollar paid in taxes. • Our commitment to develop our people. 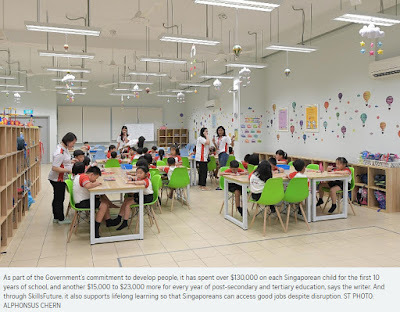 We spend over $130,000 on each Singaporean child for the first 10 years of school, and another $15,000 to $23,000 more for every year of post-secondary and tertiary education. Through SkillsFuture, we encourage and support lifelong learning so that Singaporeans can access good jobs despite disruption and change. • Our Central Provident Fund system of national personal savings, topped up by contributions from employers and Government that can be used for education, housing, healthcare and retirement needs. • Our provision of high-quality public housing and generous subsidies has enabled about 90 per cent home ownership. The value of the property appreciates as the country grows, and can be monetised for retirement needs. 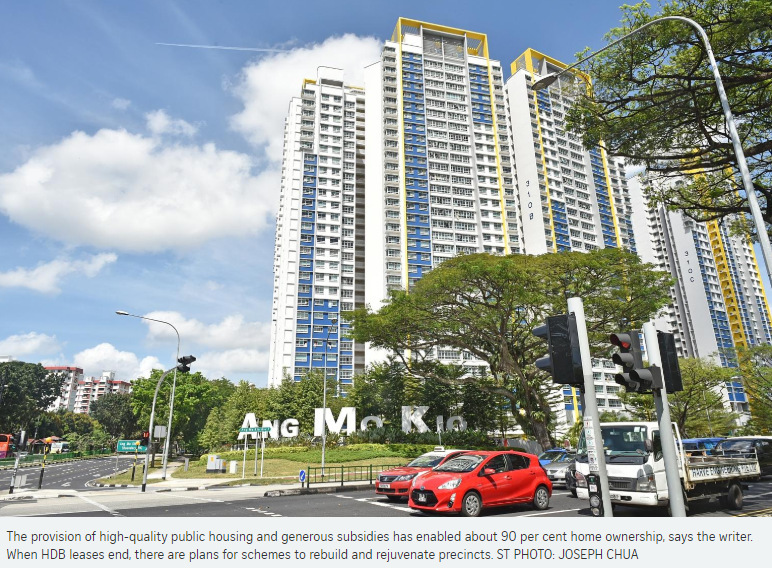 When HDB leases end, we have plans for new programmes to rebuild and rejuvenate precincts. If we were truly an unbridled corporation, we would not put back revenue from land sales into past reserves, or refrain from using up all the income from our reserves. But we do, because we believe that we must keep something for our children and grandchildren. For the PAP Government, Singaporeans and Singapore remain very much our cause. Our means may be capitalist but our objectives and goals are caring and compassionate. Our economy is based on free market principles, but its fruits are harnessed to build a fair and inclusive society. We believe in effectiveness of approach but equity in outcomes. Ours is a middle way uniquely our own. The writer is Minister in the Prime Minister's Office and Second Minister for Finance and Education.